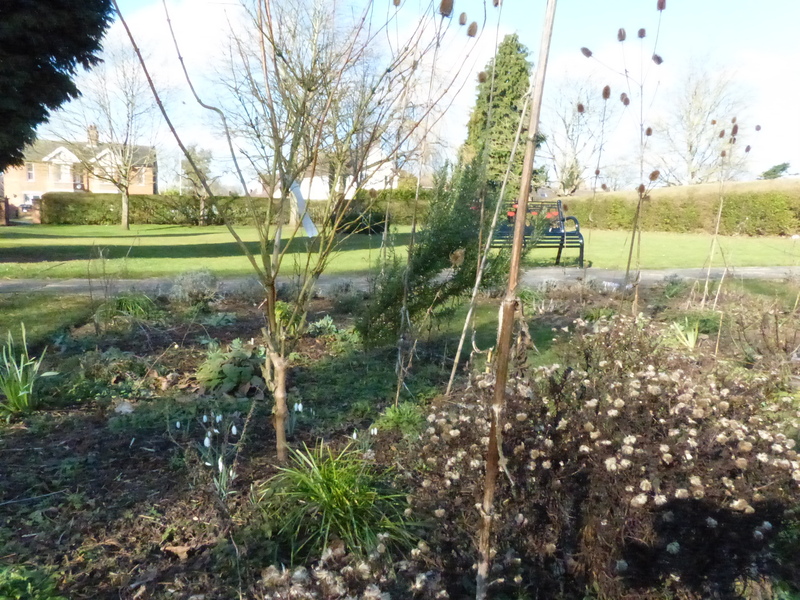 We’d usually start the spring clear-up towards the end of February, removing most of the old stems and seedheads to make way for new growth coming through. But this very cold weather means we need to leave everything there to protect the new shoots coming through, so the clear-up will have to wait until more normal late winter weather returns. 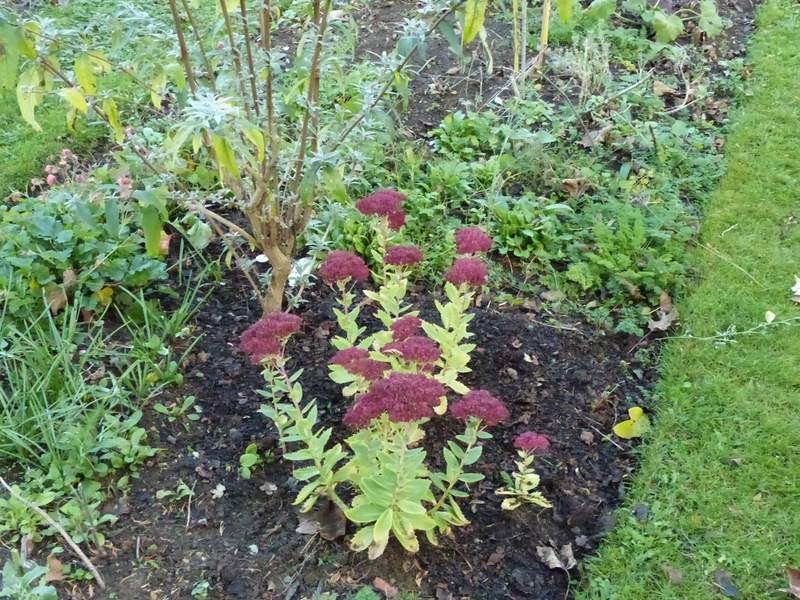 So we’re planning and taking stock of progress in the beds so far. Some years, bees have been flying on warm days in January, and there were a couple of bumblebees around here a couple of weeks ago, on a cold day in February. 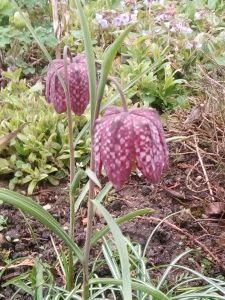 Anyway, the pollen and nectar are there for them when the weather does improve, and in the meantime we can enjoy the first flowers of the year. We’re been planning what to put in the bed where the Mentmore Road Under-Fives help us. 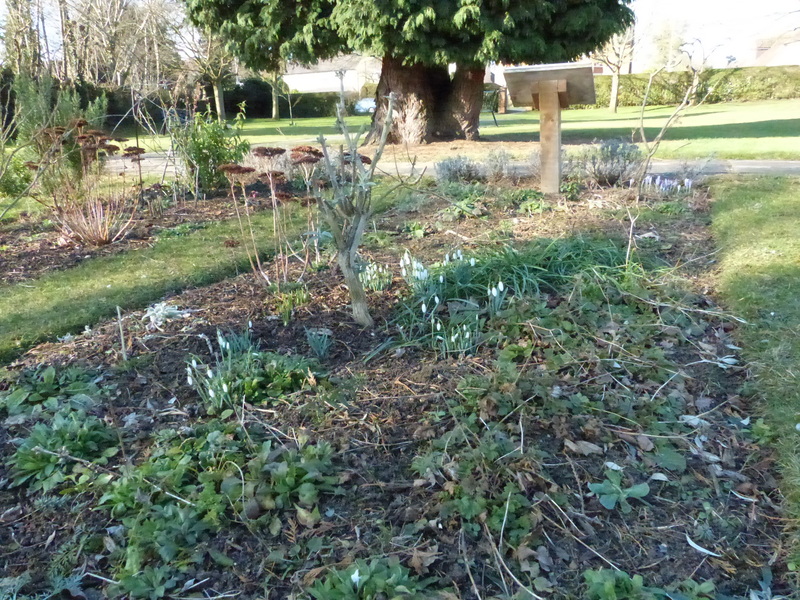 We pruned the buddleia in the middle a couple of weeks ago, and it’s sprouting new growth again already; the snowdrops we moved last year have come back underneath it, too. 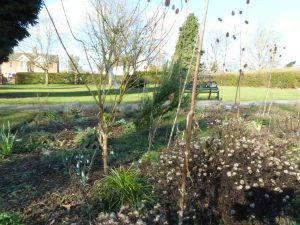 We’ve moved some of the Stachys byzantina (lamb’s ears) from the bottom bed by the memorial, to this bed, where it’ll get more sun, and where the children will be able to enjoy stroking its soft, silky leaves. That bottom bed doesn’t get much sun until later in the year, as it’s shaded by the trees along the southern boundary, and the huge conifer to the west. We’ll probably have them plant some early potatoes near the end of term, to be ready for digging up during the summer term; and even if the cold weather continues for a couple of weeks, they could sow peas in pots, to be planted out after the Easter holidays. And we’ll probably sow some pot marigolds with them there, too. This entry was posted in Uncategorized on February 27, 2018 by Pippa Sandford. This is the time of year when gardening programmes and magazines exhort us all to make leaf mould; and coincidentally, it’s the time of year when I find myself eyeing up all the piles of leaves along roads, in parks, on lawns and on pavements, and wish I had time and space to collect them all. It’s a lot of work in November, but all you have to do then is leave them for a year or two, and they turn into black gold – a free soil conditioner, seed compost, weed suppressant and reducer of hours spent watering in the summer. Perhaps most importantly, it increases organic matter in the soil, which helps plants take up nutrients. We also use garden compost, but that adds nutrients too, which isn’t always what you need – sometimes it can make plants grow too lush, which makes them less resistant to wind, storms and drought; and many wild plants and Mediterranean herbs like lavender and rosemary prefer soil with fewer nutrients. 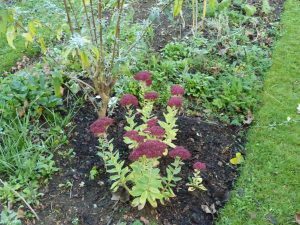 But leaf mould adds plenty of organic matter, which increases the populations of invertebrates, fungi and microorganisms in the soil, which seems to have helped the plants in the Memorial Gardens establish quickly and thrive. 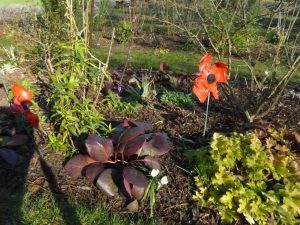 The next job will be to thin the forget-me-not seedlings – we want some of them, but we can’t keep them all or they’ll crowd out the snowdrops and grape hyacinths they’re growing through; once we’ve taken them out, we’ll add yet more leaf mould mulch. to keep those bulbs happy. The forget-me-nots are really useful in the spring, when the bees emerge and need a lot of nectar – we always think there won’t be enough flowers out, but with the self-sown ones, there always are. We add thick layers of leaf mould in the spring, to block light and stop weeds from germinating – though we do try avoid areas where we want forget-me-nots or California poppies to seed themselves around. 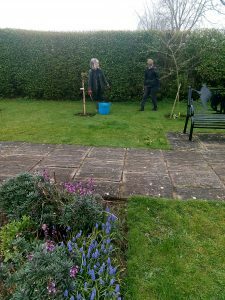 We also find the soil then soaks up water like a sponge, and holds it – you can see the difference between areas that have had leaf mould applied and those we haven’t had enough for, which tend to puddle, then dry out quickly. This year we hardly had to water at all, even with three dry months in spring. And at this time of year, we pile leaf mould up over the dahlias to insulate them against the cold – we don’t really have anywhere to store them if we lift the tubers, and the last couple of years they’ve all survived fine under their leaf mould blankets. Up till now, the only problem has been getting enough of it. 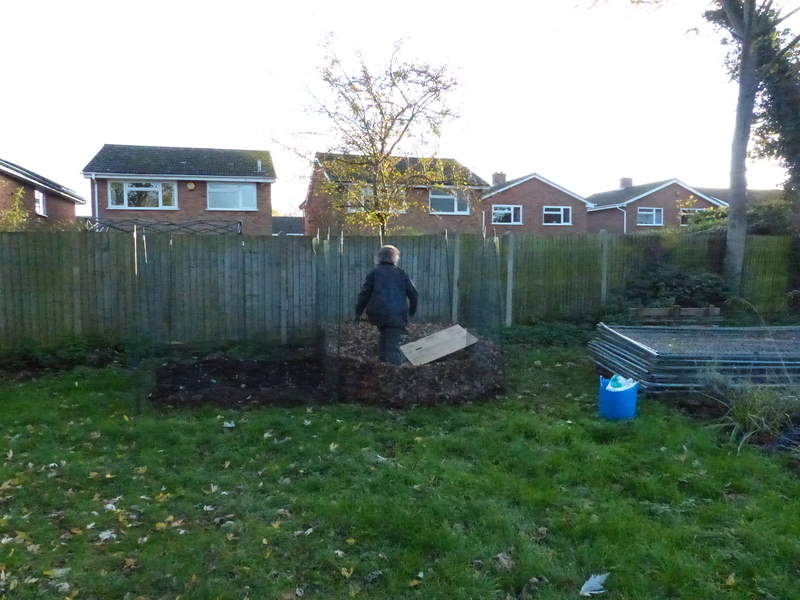 We’ve been very lucky in that the Town Council had spare leaf mould this year, so we’ve been able to use that; and we’ve now built a large chicken wire bin near our compost area, and started collecting leaves to fill it. Leaves rot down by a different process from garden compost, which rots through bacterial action; leaf mould rots down mainly by fungal activity). There are two bins, each two metres square, and about 1.80 metres high; a couple of weeks ago they looked very empty and daunting, but some of the team have been raking up leaves from the Memorial Gardens and the playing fields, while others have bagged up leaves from home and brought them over. 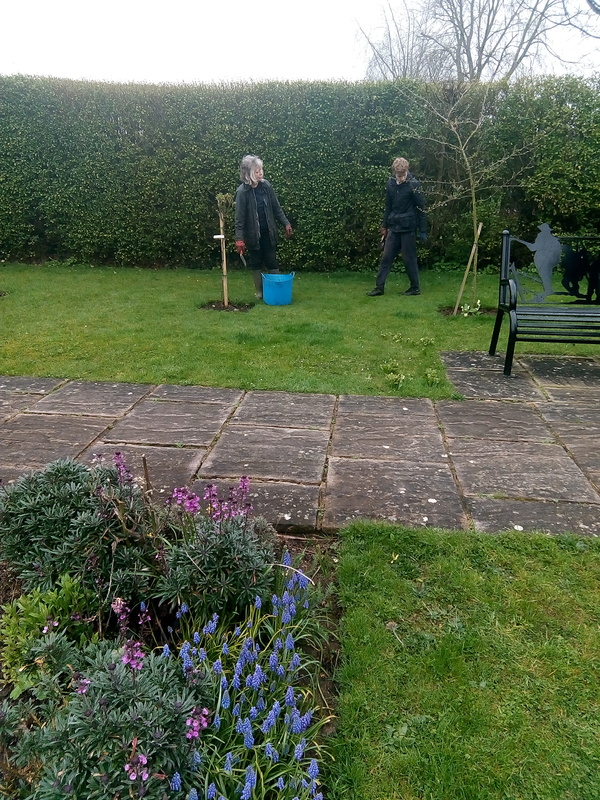 We’ve been promised more from other organisations round the town, and most afternoons some of us are out raking them up – on warmer, sunny days it’s a great way of getting plenty of exercise, though it’s a lot less enticing when it’s freezing cold and wet. Still, it’s always good to focus on how much less weeding and watering work we’ll have to do next year as a result of all our work now! One of the team treading this year’s vintage of sycamore, hawthorn and maple leaves. 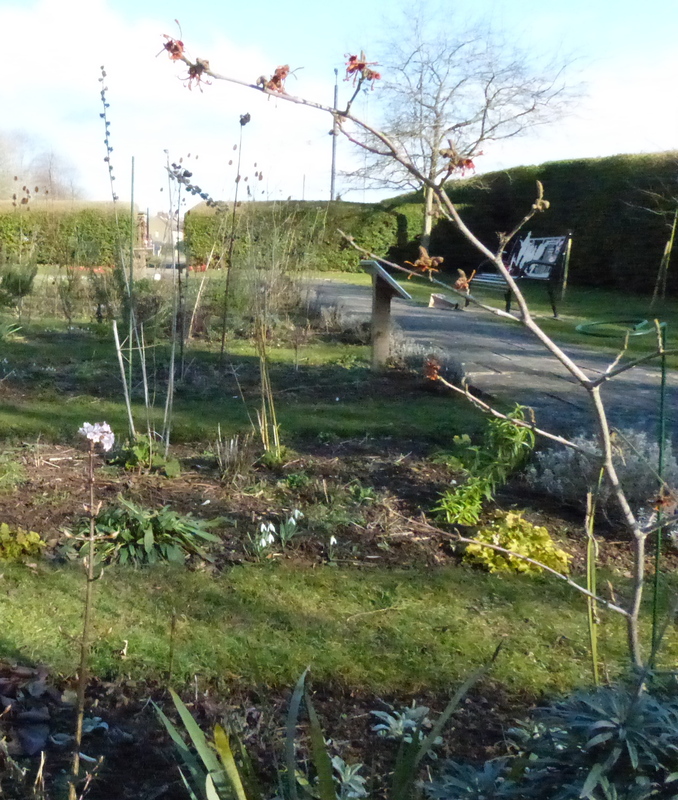 Difficult to photograph against the low winter light, but that leaf mould bin is now higher than we are! Thank you to Leighton Buzzard Narrow Gauge Railway for filling bags for us when they cleared the lines before starting the Santa Specials; and thank you to the Town Council’s ground staff, who cleared a lot of leaves from the park before Remembrance Sunday and took them over to the bin for us, to the children from Pulford School, who collected leaves from their playing fields (not forgetting Barry who organised the deliveries), to John Milebush and John from the allotments, who both gave us a lot of bags of leaves, to Penny and Janet who let us go and rake up the leaves in their gardens, and last but definitely not least, to members of South Beds Friends of the Earth, who saved bags of leaves for us. This will rot down to about a third or a quarter of its current size, hopefully with the bit in the middle rotting fast enough to provide us with leaf mould next growing season. Thank you all! 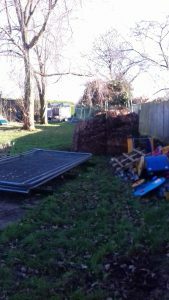 This entry was posted in Uncategorized and tagged compost, leaf mould, mulching on November 5, 2017 by Pippa Sandford. A few weeks ago I wrote about our small compost empire round the back of the Memorial Gardens. 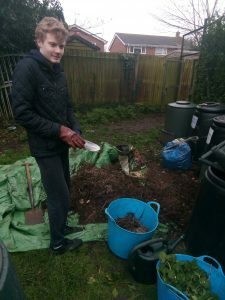 We’d started off with one bin last September, when our Duke of Edinburgh’s award student helped us start the first bin, with a lot of weeds, prunings and grass, all interspersed with newspaper, cardboard and shredded paper, then mixed together and watered. A bit like baking, really; perhaps we should enter for the Great British Compost-Off? Then again, as it can take about a year to produce the final result, it might be taking slow TV to a whole new level. 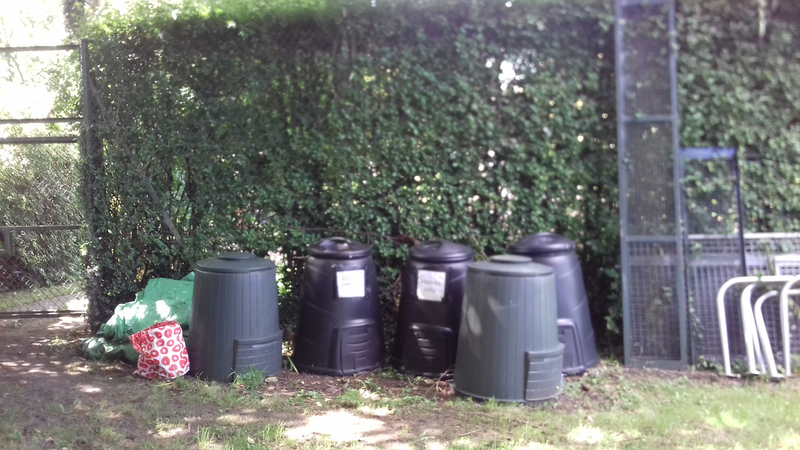 Anyway, a couple of weeks ago we uncovered the bins on the end to see how it was getting on, expecting perhaps a quarter of a Dalek of usable compost – but nearly two-thirds of the bin was fully composted and ready to go out. So instead of buying bags of manure from the communal compost heap at the allotments and transporting it to the Memorial Gardens, we were able to just ferry the equivalent a few yards to the wild flower bed, to enrich the soil so that the poppies and cornflowers will grow well and delight us all again next summer. Much easier! 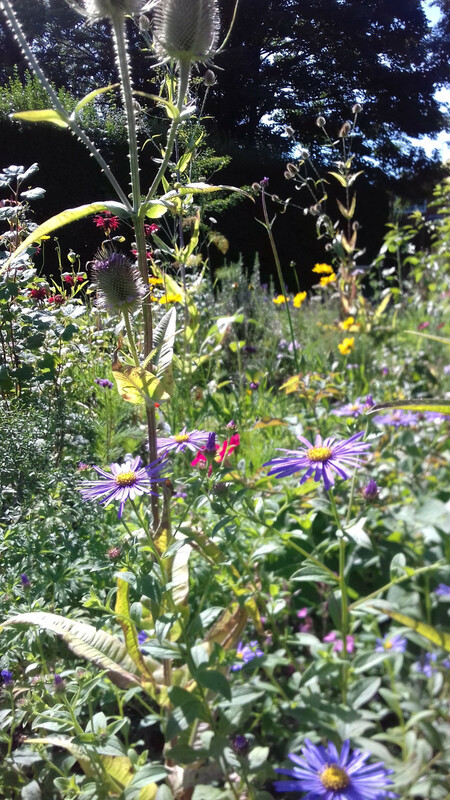 We’ve been asked a few times why we fork the bed over so early in the autumn, and this year, a couple of people wondered why we were adding compost when a lot of gardening sites and programmes point out that wild flowers grow best on poor soil. 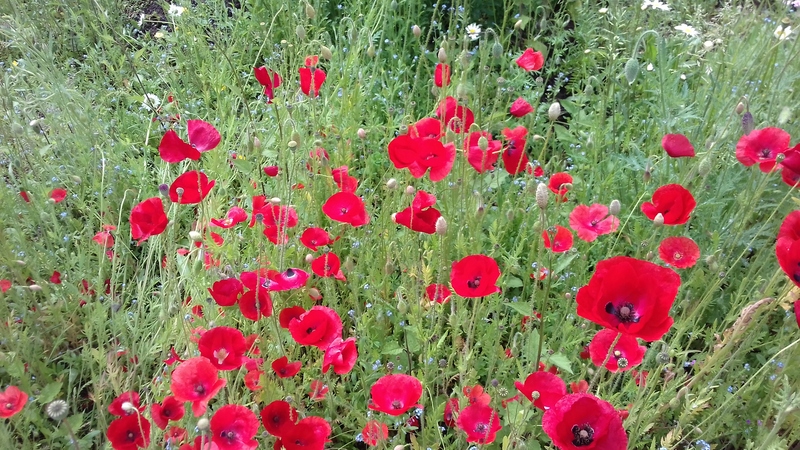 It took us a while to get the hang of it, too, but it’s quite logical, really, as poppies and cornflowers normally grow in soil that’s been ploughed, and then fertilised – so we need to do the same. The difficult bit this year was hoeing off all the first seedlings that came up, as they were mainly seeds that were present in our compost, which doesn’t get hot enough to kill weed seeds. 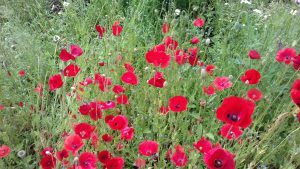 It only takes a couple of minutes to hoe them off, but we know that we’re taking out a lot of poppies and cornflowers, too, which feels a bit counter productive. 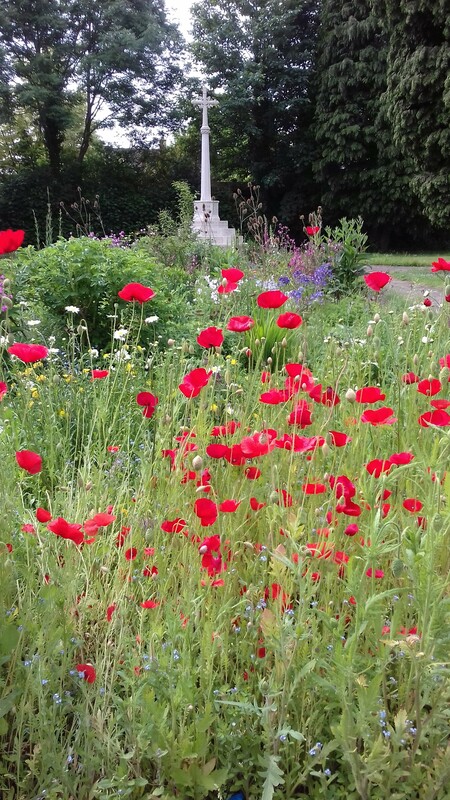 Still, it does give us a chance to weed out a lot of plants we don’t want in that bed, and there are always just as many poppy and cornflower seeds waiting to start growing when we leave the bed again for a week or ten days. 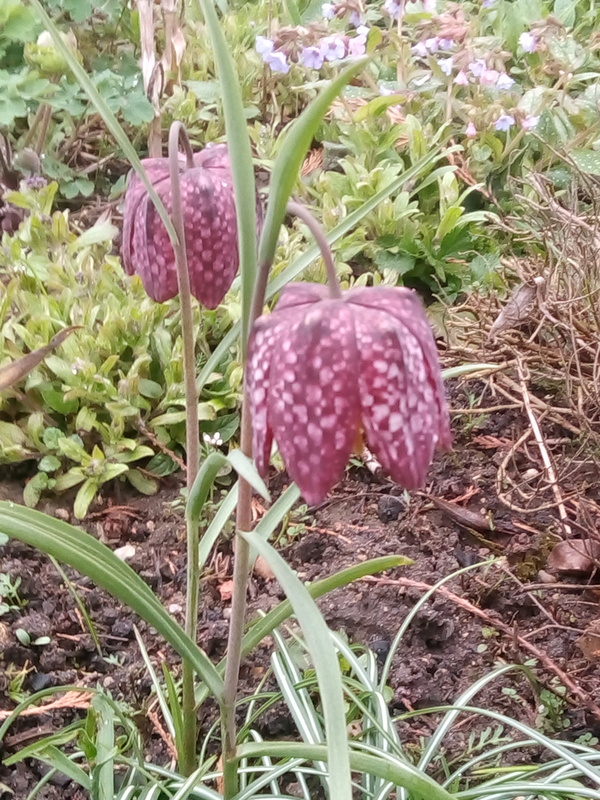 Just to make sure, we’ve added seed saved from that flower bed this year, last year, and some seed we’d bought in a year ago; some of it must come up! We could sow again in the spring, but autumn-sown annuals grow better root systems over the winter, and make stronger plants. Today we noticed that they’re coming through again already, so fingers crossed for a great display next June. 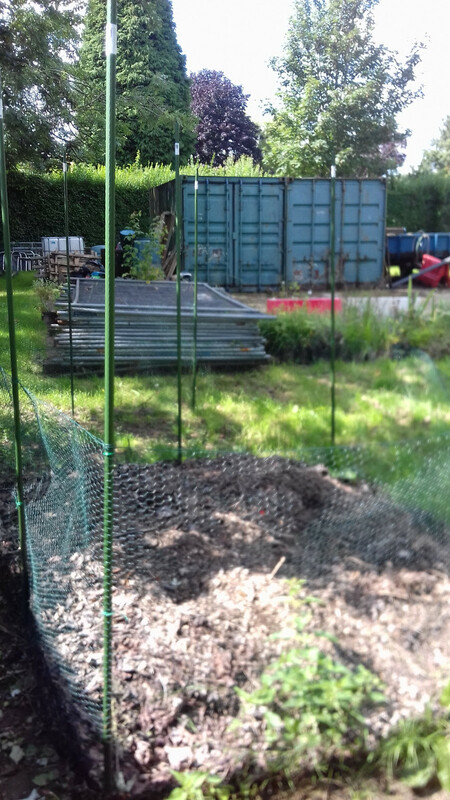 We’ve also put chicken wire over the seed bed, to try to stop people, dogs and bicycles killing off the seeds as they germinate, which happened last year. That top corner seems to be a very popular shortcut! The plants should be large enough to survive in a month or so, so we’ll be able to remove the chicken wire before the Remembrance Sunday service. 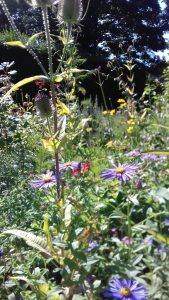 This entry was posted in Uncategorized and tagged compost, cornfield annuals, growing wild flowers on October 4, 2017 by Pippa Sandford. This entry was posted in Uncategorized on August 14, 2017 by Pippa Sandford. A slightly older child (see yesterday’s post) asked me this yesterday while I was pruning the lavender. As well as all the old flower stems and lavender leaves, we’d amassed quite a pile of knapweed and other spent flowers, and a trug-full of weeds – mainly sheep’s sorrel, which is great for bees but tries to take over the whole plot, as do white clover and self-heal, which in our naivety we originally encouraged. We’re looking forward to November this year, when we can fill one half with leaves and start the long process of letting them rot down into black gold – organic matter with very few weed seeds, to use as a mulch to keep moisture in, and keep weeds down, and as a soil conditioner. 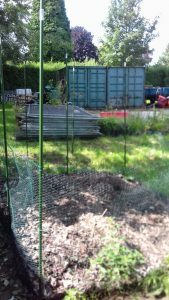 This entry was posted in Uncategorized and tagged compost, leaf mould on August 14, 2017 by Pippa Sandford.